The autonomic control of the heart is highly modulated by activity within the portion of the brain known as the hypothalamus. Afferent fibers from the brain stem (medulla oblongata) and spinal cord convey information via the autonomic afferent system to the hypothalamic nuclei within the central nervous system (10), whereas impulses that leave the hypothalamus travel along efferent fibers to the various sympathetic and para-sympathetic ganglia as noted above. Most parasympathetic response signals have been determined to originate from the anterior portions of the hypothalamus, whereas sympathetic activity stems primarily from the posterior portions (6,10). Fig. 4. The effect of acetylcholine on cardiac muscle cells. 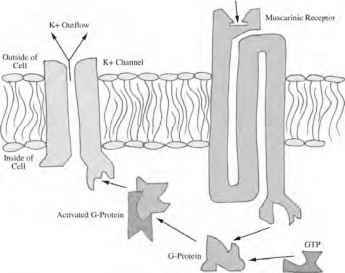 Potassium channels within a cellular membrane are opened as a result of binding an activated G protein. Acetylcholine released by parasympathetic neurons activates these G proteins by binding with muscarinic receptors within the membrane. The effect of norepinephrine on cardiac muscle cells is propagated in a similar manner, with differences as described in the text. GTP, guanosine triphosphate. Direct electrical stimulation of specific sites within the hypothalamus can initiate preprogrammed patterned changes in heart rate, blood pressure, and peripheral resistance (5). As noted, afferent axons from the aortic and carotid baro-receptors principally travel to the medullary cardiovascular centers, with neural pathways continuing onward to the hypothalamus (6). It should be noted that temperature regulation of the body is also centered within the hypothalamus. Thus, during exposure to cold, the hypothalamus initiates appropriate auto-nomic responses to maintain body temperature, like vasoconstriction and shivering. The contraction of the peripheral vasculature motivates a redistribution of blood flow to vital organs like the heart and brain to maintain their suitable function (2). The shiver reflex induced by the hypothalamus increases heat production, which in turn causes additional adjustments in blood flow and cardiac activity. The opposite outcome occurs during exposure to high degrees of heat, such that sweating is initiated via postganglionic sympathetic neurons, and vasodila-tion of the vasculature supplying the skin is amplified. 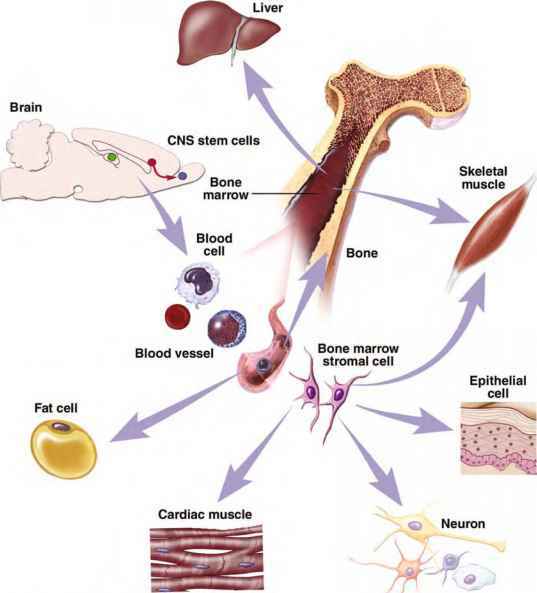 The regulation of bodily processes is an important responsibility of the hypothalamus, and it performs such tasks via the autonomic pathways, hence regulating countless systems within the body simultaneously. Keeping this relative state of constancy throughout the body, regardless of extreme changes that may occur externally, is referred to as homeostasis; in nearly all cases, there are direct effects on cardiac performance. In addition to the influence the hypothalamus has on auto-nomic pathways, emotional and hormonal changes are modulated in this region of the brain to promote homeostasis. Furthermore, pituitary gland function is mediated by the hypothalamus, inducing or suppressing hormonal release from this important part of the endocrine system to the rest of the body. Some of these hormones act as cotransmitters in the presence of acetylcholine or norepinephrine within synapses eliciting parasympathetic or sympathetic activity (2); dopamine is one example.